Home Entertainment Look at Adorable Photos of Oh Ji-ho’s Wife and Their Daughter! Look at Adorable Photos of Oh Ji-ho’s Wife and Their Daughter! Oh Ji-ho is a South Korean actor and model, who gained popularity due to his role in the MBC drama Couple or Trouble (also known as Fantasy Couple). He has also performed together with actress Han Ye-seul, and in the series The Slave Hunters (2010), Queen of the Office (2013) and My Fair Lady (2016). Oh Ji-Ho was born and raised in Mokpo, South Jeolla Province. He failed to complete an e-Business Management course at Anyang Industrial Technical School and at the age of 17, he decided to move to Seoul on his willingness to pursue a career in the entertainment world. He first appeared as an advertising model, then made his acting debut in 1998 with a small role in the film Kka (Naked Being). Some of the dramas he has played in have been exported to Japan in 2007, which attracted the attention of Japanese TV shows. His works in Korean Dramas, like Super Rookie and Couple or Trouble, brought him widespread popularity in 2005 and 2007. Oh Ji-ho, after starring in the romantic comedy Get Karl! Oh Soo-jung, got a role in the Single Dad in Love series, followed by another leading role in Autumn Shower (2005). In Get Karl! Oh Soo-jung (2007) he played the role of a pro-golfer who wants to go back to his ex-girlfriend who broke up with him when he was overweight and less successful. And in Single Dad in Love (2008) he played a martial arts fighter whose youngest son has been diagnosed with a brain tumor. Then, Oh Ji-ho appeared in Queen of the Office (2013), a comedy-drama resembling the Japanese television drama Haken no Hinkaku. Then followed Cheo-Yong (2014), where he acted as a detective and the drama series Maids (2015) where he played the role of a mysterious slave on an undercover assignment. Then, he played the role of an obstetrician/gynecologist with impotence problems in the romantic love comedy film Love Clinic (2015). Oh Ji-o married Eun Bo-ah on April 12, 2014, at the Shilla Hotel. Eun Bo-ah works in the fashion industry. They were blessed with their first daughter, Oh Seo-heun (nickname “Jibong”), on December 30, 2015. Oh Ji-ho and his daughter were both cast in the series The Return of Superman in 2016. 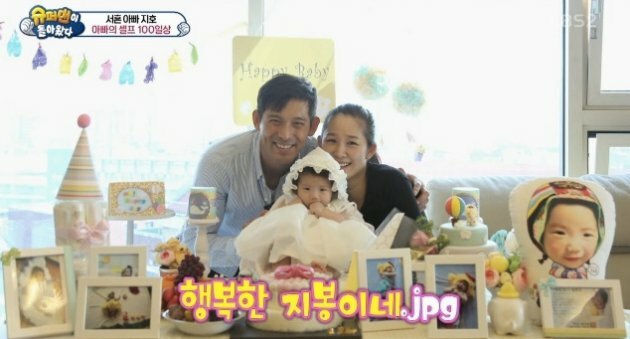 In the latest episode of KBS The Return Of Superman program on May 8, 2016, famous actor Oh Ji-ho introduced his beautiful wife and his adorable daughter to the public. As Oh Ji-ho comes home after work, his wife is feeding his daughter. His daughter, who has big curious eyes, smiles broadly as soon as she sees him. In this program, Oh Ji-ho also revealed that he claimed to be overwhelmed to think of just withdrawing from the program. “My first shooting was about the compilation of my 100-days-old daughter and that was the first time I looked after a baby. I had to wait for photos and photos, but I was really excited,” he explained during a press conference for Showdown. Fortunately, the drama actor of Third Hospital did not give up, for the sake of the future of his little daughter. He takes the positive side by claiming that he can survive in Return of Superman. In addition to mementos, the program was also able to develop Oh Seo-heun’s abilities. “The next shooting is difficult, too, but I decided to be positive because it’s not easy to record the growth of my daughter to be shown in the future. I think it will be a happy memory for her. Besides that, I think this can be used to develop her social abilities naturally. This will help her develop later,” concluded Oh Ji-Ho.